It took me a couple of chapters, maybe even reading the first fourth of the book, to start enjoying the story and decide that Ove was a worthwhile character to read about. The final chapter and epilogue were what really made me decide I wanted to give it four stars because it wrapped up so well, it wasn't all a feel-good book and it wasn't all a cry-fest book either. There isn't anything necessarily wrong with being a feel-good book, but sometimes those kinds of books seem to gloss over reality and make the world too rosy for my taste. Then, there are cry-fest books that have their place in literature as well, but reading something emotional just for the sake of making me emotional and feeling like there is so much in the world to be sad about isn't in my taste either. 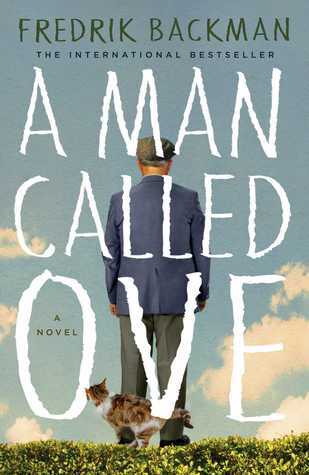 So, in the end A Man Called Ove strikes an elegant balance about depressing topics within a touching story. If you hold on through that first part of the book I think you'll fall in love with Ove's character and it might even make you take a closer look at your own neighbors, we all know an Ove or two. The slow beginning, the fact that Ove actually isn't that old (59 if I recall correctly) but often characterized as a man in his 80s, and some references being overused (the Saab) made it hard for me to give it a five star rating, but I really did enjoy the novel overall. I can imagine myself reading it again in the future and recommending it to people looking for an easy thought-provoking read that would be a good book club book because of the possibly interesting discussions that it would invoke. Favorite part of the book: "Death is a strange thing. People live their whole lives as if it does not exist, and yet it's often one of the greatest motivations for living. Some of us, in time, become so conscious of it that we live harder, more obstinately, with more fury. Some need its constant presence to even be aware of its antithesis. Others become so preoccupied with it that they go into the waiting room long before it has announced its arrival. We fear it, yet most of us fear more than anything that it may take someone other than ourselves. For the greatest fear of death is always that it will pass us by. And leave us there alone."